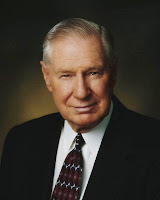 President James E. Faust (1920-2007) was called as a Seventy in 1976, then as a member of the Quorum of Twelve in 1978. 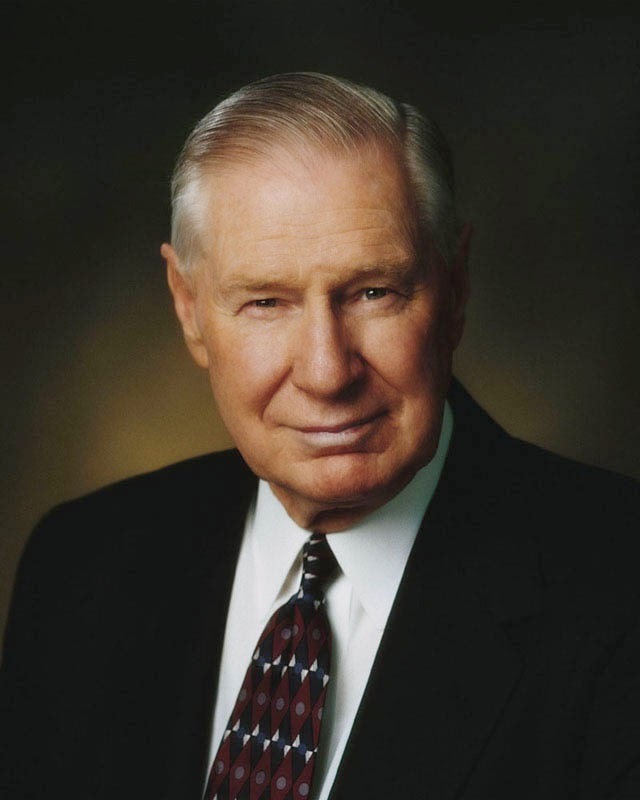 He served as a counselor to President Hinckley from 1995 until his death in 2007 at age 87. "The injured should do what they can to work through their trials, and the Savior will 'succor his people according to their infirmities' (Alma 7:12). He will help us carry our burdens. Some injuries are so hurtful and deep that they cannot be healed without help from a higher power and hope for perfect justice and restitution in the next life. Since the Savior has suffered anything and everything that we could ever feel or experience (see Alma 7:11), He can help the weak to become stronger. He has personally experienced all of it. He understands our pain and will walk with us even in our darkest hours. 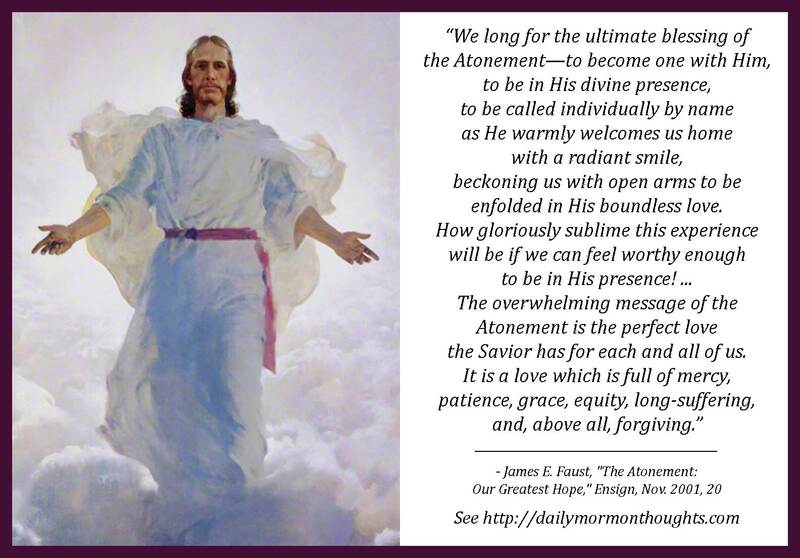 "We long for the ultimate blessing of the Atonement—to become one with Him, to be in His divine presence, to be called individually by name as He warmly welcomes us home with a radiant smile, beckoning us with open arms to be enfolded in His boundless love (see Alma 26:15; Morm. 5:11; 6:17; Moses 7:63). How gloriously sublime this experience will be if we can feel worthy enough to be in His presence! The free gift of His great atoning sacrifice for each of us is the only way we can be exalted enough to stand before Him and see Him face-to-face. The overwhelming message of the Atonement is the perfect love the Savior has for each and all of us. It is a love which is full of mercy, patience, grace, equity, long-suffering, and, above all, forgiving. "The evil influence of Satan would destroy any hope we have in overcoming our mistakes. He would have us feel that we are lost and that there is no hope. In contrast, Jesus reaches down to us to lift us up. Through our repentance and the gift of the Atonement, we can prepare to be worthy to stand in His presence." One of the realities of life is that we all get "injured" occasionally, and must learn to work through our trials and challenges. Sometimes those injuries are painful, and take time to heal. And as President Faust observes, some of the injuries are so deep that the only source of healing is through the Atonement of Jesus Christ. But we should be very grateful as we come to understand His love for us as expressed in the atoning sacrifice; He truly understands, so that He can "succor his people according to their infirmities." What a profound blessing it is to understand that doctrine and have access to the power that results from receiving His gift to us, knowing that He "will walk with us even in our darkest hours." It's so important to know and understand the difference between Satan's approach and the Savior's as we confront mistakes and challenges. Satan destroys hope and brings only despair and emptiness. But the Savior "reaches down to lift us up" so that ultimately we can be invited into His presence and clasped in his arms of eternal love. 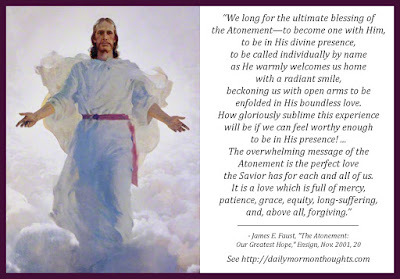 I love this profound testimony: "The overwhelming message of the Atonement [of Jesus Christ] is the perfect love the Savior has for each and all of us. It is a love which is full of mercy, patience, grace, equity, long-suffering, and, above all, forgiving."